“Come quickly, darling…there’s a damselfly on the orchid stalk”, beckoned John, my dearest hubby on a gloomy afternoon recently. Heart beating with excitement, I ran out with my camera! But the tiny insect was perched too high to capture an image. Without hesitation, John gently brought down the hanging pot which was above my head. As is typical of suborder Zygoptera, this small Red-tipped Shadefly is slender, with two pairs of colorless and clear wings that are narrow at base and similar in size and shape, which are held close along the abdomen when at rest. This dainty and delicately beautiful damselfly is about 3.5 cm long, with a black thorax that has bluish-green bands and an abdomen that is orange-red and black in color that darkens with maturity to black and light blue. It has a very conspicuous brilliant orange-red tail tip, hence its common name. I had previously thought that this male beauty is Red-rumped Wisp (Agriocnemis rubricauda) which looks very similar. However, researching further, I’m more inclined to identify it as the Red-tipped Shadefly instead! Habitat: Open areas around slow-moving rivers, drains, ponds, creeks and lagoons or running waters and swamps in the forest. Location: Found in Asia: Bangladesh, China, Indonesia, India, Myanmar, Malaysia, Singapore, Thailand, Viet Nam; Also found in Brisbane, Australia. Damselflies are usually smaller and less robust than dragonflies. They have weak, fluttery flight, whereas dragonflies are strong fliers. Their eyes are well separated, whereas dragonflies’ eyes touch on top of the head. 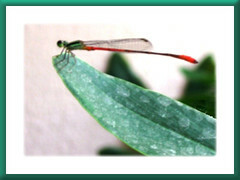 Both pairs of damselflies’ wings (fore wings and hind wings) are similarly shaped, but not those of dragonflies. At rest, the wings of damselflies are held close to the body, but dragonflies’ wings are held away from the body at an angle of about 180 degrees. 1. Red-tipped Shadefly in Brisbane.